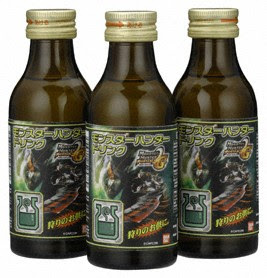 A Rinkya Blog: Monster Hunter Collectible Drink! A new Monster Hunter energy drink will be released alongside the Monster Hunter Portable 2nd for PSP on March 27th at 7 Elevens in Japan! Besides caffeine, the drink also includes vitamins and is said to have a fruity flavor. The drinks will come with a collectible cap each with a different game icon for a total of Ten to collect!